The holidays are stressful. While we all love the holidays with all the delicious food, parties and merriment, it’s hard to not feel overwhelmed this time of year. Maybe it is the shortage of daylight, cold weather, or life’s never ending to-do list. 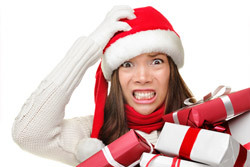 Whatever the cause, stress and its effects can ruin your holiday and hurt your health. 1). There is no such thing as perfection. We’ve all seen the movies: the tree is trimmed to perfection, the perfect gift selected and gloriously wrapped, and the perfect dinner is made and enjoyed by the perfect family. Bah humbug! Life is NOT perfect…gifts must be returned (that’s why cash or gift cards are always a GREAT gift idea! They are always the right size and color), turkey may be dried out, potatoes might be burned, families might argue. LET IT GO! Forget the perfection model and try not to sweat the small stuff. If you have recently experienced a loss or a loved one cannot make it home for the holidays, recognize your feelings and realize that it is okay to feel sadness or grief. Acknowledging your emotions and giving yourself the okay to cry, or vent your frustrations to a friend or loved one, is a healthy way to deal with this type of stress. 3). Don’t be afraid to say no. We’ve all been there…your child’s class needs 75 cupcakes for the holiday reception – YES, the office party needs to be planned and invitations sent – YES, volunteers needed at the local animal shelter – YES! This is a slippery slope. Saying yes when you should say no may leave you feeling stressed, overwhelmed and resentful. Make your sanity a priority and understand that it is okay to say no. 4). Get moving to reduce stress. Exercise is a great way to help you feel good and relieve stress. Daily exercise helps to elevate your mood and keep those unwanted holiday pounds at bay. Go for a walk at lunchtime, take the stairs instead of the elevator, or make it a priority to get to the gym at least four days a week. Planning is key – especially during the holidays. Get out your calendar and map out time for shopping, baking, visiting friends and relatives. Make sure to carve out some time for fun! Plan your holiday menus and make a shopping list. This will cut down on the last minute stress and running around, searching for that last gift or forgotten ingredient. If you are feeling overwhelmed and anxious, listen to calming music. Studies have shown that playing calming, soothing music, like classical, has a positive effect on the brain and body by lowering blood pressure. It also reduces cortisol levels, a hormone linked to stress. Listening to rain falling or taking time to cuddle with a pet can have the same effects. You’re familiar with the phrase, “laughter is the best medicine.” Your grandmother was right. Laughter is a great stress reliever. Humor and laughter can help to strengthen your immune system, boost your energy, diminish discomfort, and protect you from the damaging effects of stress. Best of all, there is no cost involved! Laughter is fun, free, and easy to use. No directions or recipes needed! 8). Don’t abandon healthy habits. Holiday goodies are so tempting and delicious, but they certainly can take a toll on your waistline and your health. Stress, digestion and your immune system all go hand in hand. Make healthy food choices including fruits and vegetables like oranges, guava and kale which have higher amounts of vitamin C. Take immune-boosting supplements, like ImmPower. Studies of emotional and physical stress show ImmPower’s ingredient reduces NK cell suppression, a result that lowers fatigue and supports the immune system’s first line of defense.